Chisa Ononiwu's jumper beat Pepperdine on Monday night. UCSB’s women were on the receiving end of some timely gifts in their basketball game Monday night. Fueled by Pepperdine‘s turnovers, the Gauchos scored the last nine points, capped by Chisa Ononiwu‘s pull-up jumper with 4.4 seconds remaining, and they defeated the visiting Waves 65-63. “We needed a win for Christmas,” said Ononiwu, who had a silent night until her late heroics brought joy to the Thunderdome. She scored eight of her 10 points in the last two-and-a-half minutes. UCSB’s comeback from a 63-56 deficit began with 1:40 remaining on a driving layup by Jessica Wilson. Ononiwu was fouled on a rebound at the other end, and her two free throws made it 63-60 with a minute to play. The Gauchos amped up their defensive pressure and forced two turnovers. The first led to a breakaway layup by Wilson with 49 seconds to play. The Waves then lost the handle again, as a diving Ononiwu slapped a loose ball to the Gauchos, and freshman Ashlee Brown was fouled hard by Teena Wickett as she tried to score the go-ahead basket with 31 seconds on the clock. “The basketball gods gave it to us when we needed it,” UCSB coach Mark French said. He noted that on several occasions earlier in the game, balls that were knocked loose by the Gauchos had bounced right to the Waves for easy baskets. Brown hurt her shoulder on the foul and was unable to shoot free throws, so UCSB’s high scorer Kat Suderman (14 points) went to the line in her place. Suderman made the first free throw to tie the score at 63. She missed the second, but the rebound went off Wickett and out of bounds to the Gauchos – another break. “Yeah, I planned that one,” Suderman said. French called time-out with 19 seconds remaining to set up UCSB’s final shot. He decided to put the ball in Ononiwu’s hot hands. While the rest of the team cleared out, the 5’7″ senior guard dribbled at the top of the key against Pepperdine defender Jessica Ross. “I took my time,” Ononiwu said. “I was watching the girl’s feet. I was setting her up. She was backing off. It was perfect.” Ononiwu drove to the free-throw line, bobbed to her left, pulled up, and smoothly stroked the ball through the twine. “My signature move,” she said. To put a finishing touch on her effort, Ononiwu defended against Pepperdine guard Daphanie Kennedy‘s shot attempt that was off the mark at the buzzer. The Wavers argued for a foul to no avail. “I stood straight up,” Ononiwu said. The Gaucho women, coming off an 0-2 trip to Oregon, improved their record to 4-5. Pepperdine, which has scored wins over UCLA and Washington, is 5-4. Miranda Ayim, an agile 6’3″sophomore, led the Waves with a game-high 21 points. Kennedy, an explosive guard, scored 17 points, but she took 19 shots, several of them forced in the final minutes. Eleven different Gauchos put numbers in the scoring column. Suderman and Ononiwu were the only ones in double figures. Wilson scored all nine of her points in the second half. Junior point guard Lauren Pedersen had five assists, including a pair of brilliant feeds to fast-breaking Meagan Williams. 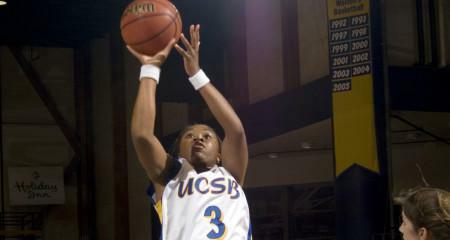 The Gaucho women will not return home until the second week of Big West Conference play on January 10. The will close out their non-conference schedule on December 28-29 at the Lady Griz Holiday Classic against host Montana and Mississippi.